March 29, 2018 — The Piedmont Post of NC, doing business as The Piedmont Post, launches. The goal is to complement the Northwest Observer by providing timely, daily digital access to news, information and events of people who live, work and play in and around Northwest Guilford County in North Carolina. The Piedmont Post is in no way affiliated with the Northwest Observer. Questions? Email news@piedmontpostnc.com and ask away. From August to December 2017, the site was used as a platform on which to publish a handful of stories written by the owner that were classroom assignments in the Fall 2017 semester at Frostburg (Md.) State University. Beginning Nov. 16, 2015, PeeDeePost.com and The Pee Dee Post is being converted to serve a new audience. The people in and around Frostburg, Md., deserve coverage of news, sports and community events at an affordable cost — and businesses deserve effective advertising options at prices that won’t break the bank. Welcome to the Potomac Valley Herald, a locally owned dedicated outlet here to document the people in and around Frostburg, Maryland. We’re here to serve your editorial and advertising needs. Call 910-331-4130 or send an email to peedeepost@gmail.com with questions, concerns, details on upcoming events and more. PeeDeePost.com launched on April 28, 2014. We’re excited to begin covering the people, news and events in and around Richmond County, North Carolina. We’re not from here, but this is a place we choose to call home. The Pee Dee Post and its Internet home, PeeDeePost.com, aims to be your daily news source for all things Richmond County. We won’t get to everything — no one can — but what we do get to will be covered accurately and available to you in a timely manner. Our ability to do this is by offering a high-value package of news and sports coverage supported primarily by paid advertising along with other, smaller revenue streams. Why advertise with us? We’re growing. From May 1, 2014 through Dec. 31, 2014, PeeDeePost.com averaged more than 40,000 individual readers each month. There is tremendous upside to this project. There is no (and won’t be a) paywall, which means your news, columns and advertising will be available to anyone and everyone who visits PeeDeePost.com. ** A proud corporate sponsor of the Richmond Raiders Marching Band (2014-15). Go Raiders! The Pee Dee Post is funded in four ways — through (as of April 3, 2015) display advertising, classified advertising, paid obituaries and through individual contributions from readers like you. Click here for reasons to support a locally owned and operated independent news outlet. Tax forms and audits will be published here beginning in 2016. For now, though, we are pleased to offer the transparency of showing readers the names of individuals or businesses that have funded The Pee Dee Post in the amount of $1,000 or more. Those funders included: Richmond Community College, Murphy Chiropractice and Wellness. 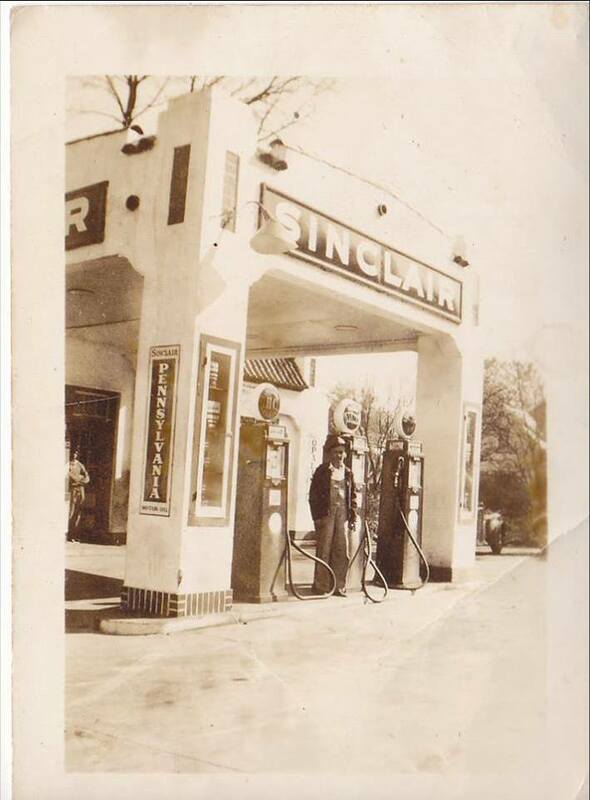 It has been a gas station, a hair salon, a real estate office. It almost became some sort of ice cream shop. And now it’s home to the staff of a digital newspaper. We’ll bet that no one thought of that in 1943. Photo courtesy of Glenda Moore Sherrill via “I Grew Up in Rockingham, NC. What’s Your Excuse” Facebook forum. 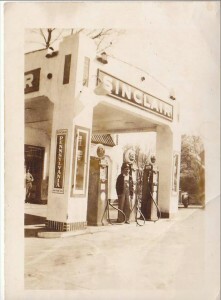 The image shows William S. Moore at the Sinclair gas station — the PeeDeePost.com office — as it appeared in c. 1943.